At Sensel, we created more than a new device, we created a best-in-class touch interaction technology. However, we knew we didn’t just want to build a technology company. Instead, from the very beginning, we wanted to focus on building great products that would be loved by our customers, and would allow them to interact with the virtual world in a more versatile and expressive way. The idea for the Morph came from the realization that there are so many physical interfaces that are fixed and single-purpose (keyboards, mice, midi controllers, art digitizers). These interfaces don’t make much sense in the context of the rest of the computing ecosystem. Our laptops and tablets are upgradeable and customizable – nothing is ever fixed or single-purpose. Tactile interfaces are also far from being entirely replaced by touchscreens, as the modern computer/tablet is nearly always paired with a keyboard or some other physical interface. The Morph is the first product of its kind and it’s directly addressing this mismatch by finally bringing physical interfaces up to par with the rest of technology. When we showed people the Morph, they all reacted quite differently. Some reacted saying it could change digital art forever, others said it would be amazing for film editing, while musicians had their minds running about all the instruments and controllers they could customize. Although we could have chosen one area to focus on (art, music, gaming, etc. ), after seeing the varied (but equally enthusiastic) reactions from everyone, we felt it wouldn’t be fair to choose just one category for this technology. There are reasons that we decided to focus on addressing the needs of “creatives”: artists, musicians, gamers, makers and developers. For artists and musicians, they already understand the value of having a device that can detect new levels of nuance and expression. Artists see the value of being able to use their own tools (paintbrushes, pens, pencils) for the first time in the digital world. Musicians are excited to design new instruments/interfaces where they can take advantage of not only pressure but also position (like using a finger-rocking gesture to pitch-bend a note). We’re hoping that makers and developers use the Morph’s API to push the boundaries of what’s possible and lead the way in-terms of developing new interactions and use cases. After deciding to make the Morph, well, “morphable”, we had to decide what channel to go through in making the device available to the public. After contemplating our options, crowdfunding was the clear choice. We chose Kickstarter because, in addition to helping us get our funding, we’d have an awesome community of supporters and what we like to call “conscious consumers” at our disposal. A conscious consumer, in our minds, is someone who is not just blindly buying a product, but is willing to give feedback on what they think of it. The opinions of our customers are especially crucial in this early stage of our company, as we want to implement as much feedback as possible into our product functionality and design. As we had hoped, Kickstarter has already proven a great route. We’ve gotten invaluable feedback from backers and non-backers alike. We’ve been able to compile a list of art software that supporters have mentioned that they’d like to use with the Morph, and fully intend on making it compatible with every one on that list before the first batch of devices ship (see a video of the morph working with Photoshop here). We’ve also gotten great feedback on different kinds of keyboards, and now understand that many out-of-country backers would like options outside of the QWERTY keyboard including keyboards for other languages and that there is also a lot of interest in ergonomic keyboards. All of this feedback, and everything else we’ve been hearing, is invaluable to us. If we wanted to go straight to selling this product in the store, we’d be missing out on the opinions of people who are very interested in what we’re doing, and sometimes just as passionate about it as we are, and that’s why Kickstarter was a clear choice for us. We’ve also been able to use the Kickstarter platform to regularly update people interested in the Morph and to create video responses to the most common questions from backers. For example, we’ve created a short video series called “Will It Sense” where we show the Morph detecting objects that people have requested (see the first video here). We’ve also been able to show our community a video of a Pianist using the Morph for the first time (see video here), and how the Morph is quick enough to sense the beat of drumsticks (video will be ready by tomorrow). Being able to have a platform to share these video updates and get feedback on them from backers and non-backers alike has been of great value to us. Given the chosen route of crowdfunding, we’ve also been able to create a great way for our supporters to take some matters into their own hands: We held an Overlay Contest. With this Overlay Contest, all were able to submit overlay designs and we will choose five for the backer community to vote on. The Overlay that wins will be added as an 8th overlay option that backers can choose from to receive with their Morph (to learn more about the contest, please visit sensel.com/overlaycontest). On the down side, since many Kickstarters are put on by companies that may barely have prototypes, we do see some skepticism. Rest assured, our device works as is promised in the video and, by the time we ship, it will work even better. We’ll also be holding Meet-Ups in the Bay Area before the device ships. Our first Meet-Up, a joint effort with Make Media Labs, will be on October 6th in San Francisco. We’re also holding a party in the fall in San Francisco for all of our first-day backers, and they’ll all be able to test out the device themselves and see it in action! Some things really aren’t too good to be true. To see some of the great press we’ve gotten since launch, please visit sensel.com/press. 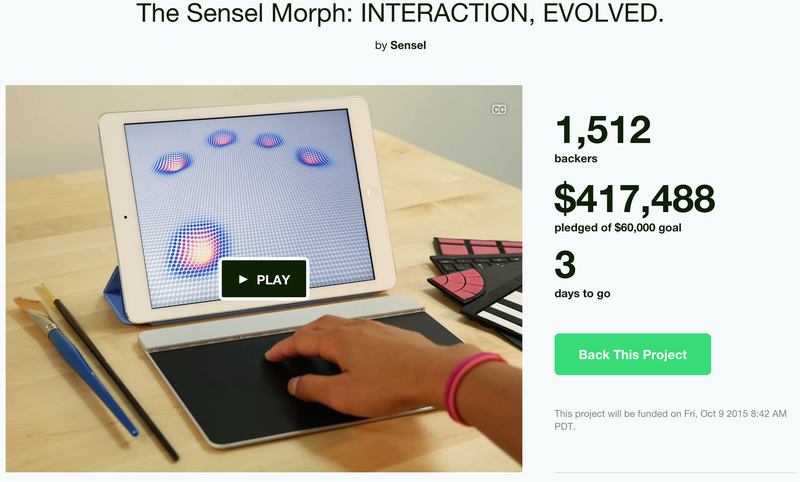 *The Kickstarter Campaign for the Morph ends on October 8th. All who purchase from Kickstarter will be getting a discount. A sincere thank you to all who have backed us thus far, and made it possible to reach our initial goal in less than 3 hours! We’ve also been able to make and reach a $250,00 stretch goal! Given this, all backers who ordered Morphs will receive a stylish and protective sleeve to store their Morph and overlays in. Visit our Kickstarter and spread the word before the campaign ends on Thursday http://kck.st/1Ub3XuQ — Thanks for all of your support! I’m very interested in your project, but unfortunately it was too late to be backer on kickstarter. I want more new information about Sensel morph. But Ｉ will be moderate to be asking too much, Because I also want your project go forward earlier. I’m sorry for my terrible English. Anyway, Hang in there, and Go for it!